On the quiet outskirts of Lassi, this spacious property enjoys stunning views of Kefalonia\'s scenic coastline. With large and comfortable apartments, pleasant lawned gardens and a leisurely atmosphere, this is a fantastic setting. We have just returned form 2 weeks at Panorama apartments. The apartment was very good albeit basic. It was cleaned 6 days a week and linen changed twice a week. The pool bar area was nice plenty of room and the sun beds were never full. Arthur and Leanne who ran the bar and catering where both lovely and were always on hand to serve you when needed. The cleaners were very friendly although they didn't speak much english. 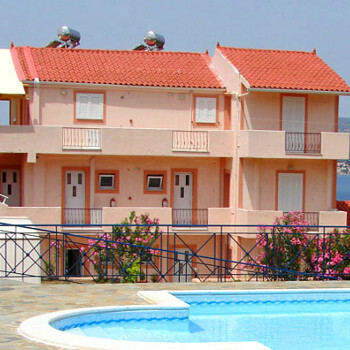 We had a 2 bedroomed apartment on the ground floor which from the patio area in front had a stunning view over the sea towards Luxouri and argostoli. We would definetley stay here again and would recoomend it to friends and family. The hill was a bit steep ok to walk down but with the taxi fare only 5 euros back up it was well worth it. The local supermarker delivered groceries etc 3 days a week so this did save you having to carry loads of shopping back up. The Panorama Village has comfortable and clean studios and apartments and although up a rather steep hill which got easier as the week went on the views were not panoramic from the rooms, only from the pool area. It was an ideal place to stay although I feel the staff could have made more of an effort with regards to looking after the guests. They just sat at a table smoking and drinking coffee all day until somebody wanted serving. Also when anyone ordered food it was put on the bar for collection and you were shouted at across the pool to come and get it. If I was working there I would have asked if the customer wanted their food inside or out, provided little poolside tables and brought it out to them. One older lady had to carry two heavy plates back to her sun lounger on the slippery floor. Lovely place, but better service please. We read all the reviews about the Panorama before we booked, but were unlucky as the price doubled due to the Excel crash, as I think the studio appartment was only worth the original cheaper price, not what we paid. We asked for first floor but got ground, maybe because we booked last minute or we should have asked for top floor as those rooms had patio doors onto the balcony and maybe a view, whereas we had a door and a smallish window which meant it was dark and dingy in the room especially when it rained. The room doesnt have a sofa so for comfort you have to sit on the bed if it is too wet to get outside for entertainment. The bed I found really hard and uncomfortable and the pillows like cement which meant I didnt sleep very well and was awake with hip pain as the hard bed aggravated it. Other than that you get used to what youve got and fortunately we had some sunny days on the local beach which was fairly quiet. There is good Karaoke bar on Fridays which was a laugh as I have never been there before. I would recommend the Grill House on the square in Argostoli, the sort of place I wouldnt normally go to but found at 12mn on our first night of trying to find our way around. The food was good everywhere although someone told us to avoid Butlers House, someone here has given it good reviews, we made the mistake of going to Zorbas, the food was tasteless,for both of us and the house wine which was good every other place, like paint stripper, so probably avoid. We found all the people who worked in shops, bars, restuarants very nice and friendly. well when you see the hill alsorts of thoughts run by you but! when you get to the apartments and see the veiws it all worth it.my wife doesnt walk anywhere but she didnt mind thne walk very strange, great place, nice staff, very clean, great breakfast from the bar in the mornings, not till 10am or when he turns up but worth waiting for.great resort, we have been to alot of islands and im going back 2009if you like diving steve the dive instructor in the maun drag really gives you a good days diving and very reasonable.fantastic weather sept 2008.
stayed here this year and we loved it, we had a 2 bedroom apartment (A1) with 1 double bed a room with 2 singles and the sofa bed in the lounge area, they now change bedding and towels 3 times a week and rooms are cleaned daily except on a change over day. if you book then dont moan about the hill, sorry, mountain ! you get used to it, keflonia is all mountains. the pool area is great, no need to reserve beds as there are plenty and the sun dont go down till about 7:30pm as there are no apartments around the pool.argostoli is less than 2 miles not 10km. Room was fairly basic but clean and very spacious.Gardens are well tended - we were on gound floor and had a lovely olive & oak tree to give us shade. Complex was at the top of a steep hill as mentioned in brochure but we came home fitter than when we went and despite all the eating/drinking we lost weight as a result! A lot of people got taxis up the hill and I think they are reasonably priced. I had read that Lassi was a busy resort but we didn't find it so. All in all we had a very enjoyable time at Panorama - I think it works best for people who go off & do their own thing as there is no reception area or contact with owners. My partner did use the bar to watch Euro 2008 but it lacked any atmosphere. My girlfriend and I have just returned from spending a week at the Panorama Studios in Lassi, Kefalonia. We found the apartments to be very clean and the kitchen facilities were satisfactory. The beds are two singles pushed together however this was still quite comfortable. We stayed in a room on the second floor which had a balcony. If you have a room on the ground floor you get a terrace patio area. We had a glimpse of the sea although the olive trees do obstruct most of the views which is a shame. The view from the pool however is breathtaking. This brings me onto the poolside bar. It offers a wide selection of both alcoholic and non alcoholic drinks if a little pricey as well as snacks. My only gripe is that they only offer these snacks until 2pm! The pool is clean and not too cold either, plenty of sunbeds spread around the area. It does not have a reception area or any presence of supervising staff, so if you did have a query or problem, you would have to take it up with your rep.
All in all, it does deserve its 3 stars and the complex is less than 10 years old. If the owners read this: please install hooks for the shower heads!! It was tricky trying to clean as well as hold the showerhead at the same time! We booked self-catering with First Choice at this resort and were given a room on the second floor that was accessed from behind the apartment block. The room was great, very impressed, especially the bathroom. Very often Greek apartment rooms have a shower but no curtain or door. This did and you could have a shower without soaking the place. As stated in the other reviews it is situated on a hill. The road is concrete and a bit dusty and can be slippery in places under foot. Saying this it was a great walk to build up an appetite for dinner and walking it off after. The main strip is about a 10-minute walk away. This is not a walk for anyone with walking difficulties. The strip offers fantastic food with each offering its own unique take on food at very good prices. Service was always excellent. Just bear in mind that the Greek take their time and it is very relaxed, there is never a rush so be prepared for a delay for the bill etc. This just adds to the relaxed nature of the place. The beach is located a short walk from the main strip making it about a 20 minute walk in total. Located along towards the rocks was a great place for snorkelling with hundreds of fish to see. We decided not to spend a great deal of time on the beach except the evening snorkel but decided to explore the resort on foot. A short walk around the road that heads towards the capital (costal route) are the most stunning hidden coves with crystal clear water. We decided to walk this way to the capital Argostoli via the lighthouse. This is about a 10k walk so be warned. The capital is fantastic. A number of times we flagged a taxi down on the strip and went to the Square. A short walk is the harbour, which is amazing. A footbridge joins the harbour to the other side and is well worth the walk. About a 10 Euro return taxi fare. The Square itself is great for evening meals.